When my daughter was born, my wife found herself unable to nurse our infant. That gave me the privelege of sharing the midnight feedings. Tiffany was a dream: I could zap the formula in the microwave, change her, feed her the whole eight ounces, and tuck her back into her crib- all in under twenty minutes. Then our son came along. Midnight feedings with him were horrendous. Although he had an enormous appetite, he sucked and darnk with only three speeds: slow, dead-slow, and stop. 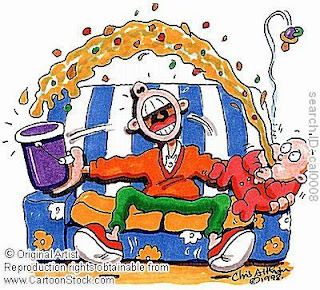 Worse, he had to be burped every ounce or so- a painfully slow process - or he would display his remarkable gift for projectile vomiting. Without any warning, he could upchuck what he had taken in and send it fifteen feet across the room. If there were an Olympic event in projectile vomiting, he would have taken one of the medals. I never got him back into his crib in under and hour; an hour and a half was more common. At least he had an excuse. He was young, and his digestive system was obviously not as well-developed as his sister's at the same age. Best of all, he quickly outgrew this stage. But there are Christians who are international-class projectile vomiters, spiritually speaking, after years and years of life. They simply cannot digest what Paul calls 'solid food.' You must give them milk, for they are not ready for anything more. And if you try to give them anything other than milk, they upchuck and make a mess of everyone and everything around them. At some point the number of years they have been Christians leads you to expect something like mature behavior from them, but they prove disappointing. They are infants still and display their wretched immaturity even in the way that they complain if you give them more than milk. Not for them solid knowledge of Scripture; not for them mature theological reflection; not for them growing and perceptive Christian thought. They want nothing more than another round of choruses and a 'simple message'- something that won't challenge them to think, to examine their lives, to make choices, and to grow in their knowledge and adoration of the living God.